Our staff loves reading so much that we created our very own book blog to tell you all about it! Whether it's James Patterson, Patricia Cornwell or even Judy Blume, find out about all the latest and greatest books from us! I have to give Wally Lamb some credit - the man certainly has an almost athletic sense of endurance to constantly keep churning out 600+ page novels. It's hard to keep a reader's attention for that long. Lamb almost managed to keep mine for the entire novel - I started skimming on certain sections because I knew that they weren't *really* that relevant to the direct plot line. However, that being said, I really enjoyed this one, so much so that I managed to finish it in the course of a weekend, which is pretty good for me. Anyway, the novel centers on Caelum Quirk, an English teacher, and his wife Maureen, who unfortunately happens to work at Columbine High School on the day when Dylan Klebold and Eric Harris commit the atrocious mass-shooting. Maureen survives, but becomes a shell of her old self. In an effort to help Maureen recover psychologically, the two move back to Caelum's old family farm in Connecticut. A lot of stuff happens at this point - Caelum rediscovers that his family tree is a lot more gnarled than he ever imagined, Maureen is the cause of another awful tragedy, and their marriage must undergo many many hardships. Lamb's books are always kind of depressing - he always manages to really pile on a lot of terrible things onto his (male) protagonists. At some points, I was like "oh come on, give the guy a friggin' break, already," but it really makes more some compelling reading. The one good thing about his works though, is that each characters always finds some kind of redemption at the conclusion, which is definitely satisfying. Something that I found to be quite "fun" about this novel was that characters from Lamb's other mega epic I Know This Much is True reappear (albeit as very very minor characters, but still). 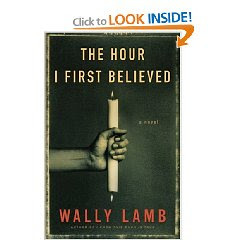 It's a neat idea and kind of adds another dimension to Lamb's literary universe. Do you want the library to order a particular book?